Mixed Bag of Rant: Sad. Lonely. Tired. OMG- just realized this post was in draft! I wonder why I never posted it? Weird. Anyway thought I would publish because of the adorably cute picture of my baby. Okay, say it with me now. Awwwwwwww! Yup, that's my little angel! 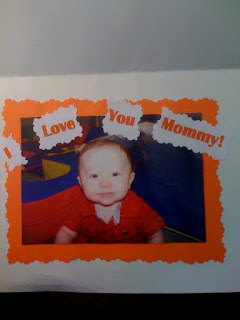 That just happens to also be my first ever official Mother's Day card! I think it is more than appropriate that I got one from him before anyone else. After a very challenging week, it really made my day and I can't stop looking at it! It has indeed been a challenging week. A challenging last couple of weeks for that matter. My darling husband has been traveling this great nation being a technical wizard. The better he gets at his job, the more they keep sending him out to clients. He's quickly becoming a hot commodity. I am super proud of him, but no lie, it is tough balancing a full-time job and an 8 month old (holy crap- my baby is 8 months old??!). All I can say is: God Bless the single mamas out there, because doing it on your own is a TOUGH job. There's no telling if you'll have a great night or a horrible night with sleep, you have to plan your potty breaks, you have approximately 5 minutes to eat dinner in preparation for an evening temper tantrum. Not to mention our poor, sweet amazing dog Sadie who needs attention as well. For two weeks, I had only one really horrible night where Jack woke up at 3:30am and just didn't bother to go back to sleep. Brings me back to the old college days where I would pull an all-nighter studying for a test and then slugging around the next day just hoping to stay awake. That is how I felt after that night. For the most part, I have lived off of caffeine and just constantly reminding myself to stay positive and not get frustrated with myself, with my husband or with Jack. I often get the advice of going to family or friends for help. I know that they have offered their services in the past and I know that I've turned them down. Which is probably why nobody bothered to even remotely check on me over the past two weeks to make sure that we were getting by okay. Let me explain myself... I GREATLY appreciate the offers to come over and help out and hope nobody thinks I take them for granted. I am a very routine oriented person and having someone come over to try and help sort of disrupts the routine if that makes sense? It actually makes things a little more difficult. What I would LOVE for someone to do, rather than help with Jack persay, is to drop off something for me to EAT. Pizza Rolls get seriously old after two weeks but are the fastest to nuke in the microwave in a very short amount of time and I didn't want to get fast food or take out every night. It just gets to be a lot. I know it is my own fault for turning so many away in the past, but that doesn't mean I don't like to hear the offers, ya know? Am I making any sense in my sleep deprived state? On a bright note for the day, hubby was able to get on an earlier flight thank GOD. We'll actually have a meal together and he'll get to see his baby for more than 10 minutes. I wonder if anyone else has noticed in the news that there has been a LOT of stories about bad mothers and parents? I mean... everything from feeding your 6 months olds McDonalds to not buckling your child in a carseat and having your FOUR WEEK OLD BABY flying out the door to biting your kids to discipline them. It makes me sick. It hurts my heart. These people have no idea that there are actually people out there who would give anything to have a baby and THIS is what they do. Tragic.